Home » Forums » Troubleshooting, Repair & Modification » Capacitor Replacement » Definitive Cap list? I've got two amps to be recapped, a HD130 2x10 and 65 2x12. I'm not an electrician by a long shot and rely on forums like this for knowing what to get and where to get it so I can hand things off to the tech with instructions in hand (biasing, etc). The manuals on this site are a great find. But it takes some digging to find a full cap replacement list (i.e. every capacitor that should or can be replaced). Maybe it makes sense to make this post/thread a reference for all those like me who visit the forum in the future? I’m a relative newb here, though I’ve posted a few things and will no doubt keep adding in the future. I’d greatly appreciate it if someone could verify my research before I purchase, and add anything I might need. Ordering myself I can insure the highest quality possible, also I don’t want to cut corners, i.e. do it once, do it right. As you can see, the lists are a bit different. Specifically the ‘bleeder resistors’ are rated at 2W. I have no idea what any of that stuff means, but could someone make a (more or less) definitive list for other HD130 owners who visit the site in the future and simply want a list of every cap to replace? Even better if it’s like the list below for the 65 2x12 which shows where each cap is installed. Obviously the tech would know this, but it’s hard for guys like me to get an idea of what we’re doing without the basic information. Also, please chime in if the list below is correct. I could only find one posting of same so don't have anything to compare it to. I’ve read that Mouser in Canada should have all parts, and from what I can see that seems to be the case though I haven’t been able to verify each one yet. The below parts are from other members who listed the part numbers. Mouser or Newark have the parts for the 65 amp as you have listed. Alternatively, you can check Reverb.com or eBay, sometimes you can find much better prices, especially if you buy more than one cap. As long as the cap is from recent production/fresh (not NOS or "vintage") you should be fine. Using a cap with a higher voltage rating is ok to use too. A 22uf or 25uf in place of a 20uf is no problem either. Any HD130 comments? Capacitor list. . . Thanks for verifying the 65W info. Hopefully someone will be able to clear up the HD130 questions. I'm looking forward to getting my babies all tuned up! ALSO: Sometimes I get a radio station coming through one of my amps. It only happens at certain volumes, and maybe with a pedal in use. I haven't been able to narrow down the factors, but I seem to have read this can be an internal problem with some kind of filter? Of course it can be bad cables, pickups, etc I ralize but it's only happening with one of my amps which leads me to think it might be internal. The only time I have ever picked up radio signals with a MM amp was when I had an RP 65 open and was trying out some different gain resistors with alligator clip leads. I assumed the extra wire acted as an antennae. Once removed, the amp was normal again. The only thing that's different about my setup from most is I use a step down transformer to get from 220v to 110v from the wall. Other than that I'm without a grounding prong on the plug - but as far as I know that's not related. I'm only going to give you ONE piece of advice since you say that you're "not an electrician". Do one cap, try it. Another cap, try it. If you do it all at once and you have a hiccup, you won't have the knowledge possibly to find the problem. I've been doing this crap for centuries (ok-that's a stretch) but you get the idea. If you muck up one thing at a time, you'll KNOW which component is bad. I've got a 130 chassis in the basement if you need any photos. Mike. I was planning on having it done by a tech, but I'm contemplating a DIY so I can up my skills a bit. Were it not for this forum I wouldn't consider it - but it seems there's more than enough know how on tap. I'm comfortable with tools in general and figuring things out. As for soldering skills, functional but not great. I'd probably fork out for one of those fancy kits with adjustable temps etc. Then I can stop buying cables to boot and make my own. Maybe even knock out a RAT pedal from a kit. I haven't seen any 'instructions' on the forum aimed at guys like me for a recap job - maybe on purpose? Probably not a great idea for most to mess around with high voltage. But as long as I can make sure the thing is completely discharged and there's no threat of touching something I shouldn't I think I should be good to go. We'll see. I'll be waiting on parts and tubes etc for a while so there's time to think about it. But one cap at a time sounds like good sense. They are an on-line service...but they are located in Burlington, Ontario, Canada...so no shady off shore issues. Lots of high end audio stuff...plus some cool vintage NOS tubes etc. They have F&T capacitors and other quality high voltage capacitors. Please let me know if the graphic has the right info. Just trying to leave a workable trail for players (i.e. non-techs) interested in recapping themselves. Short answer is if you’re comfortable soldering, you can do it, but only with extreme care as the voltages involved can kill you if you don’t follow the right protocols for de-powering the amp. Techs: Please keep an eye out and let me know if anything posted here is confusing or incorrect as I’m going to document things as I go. 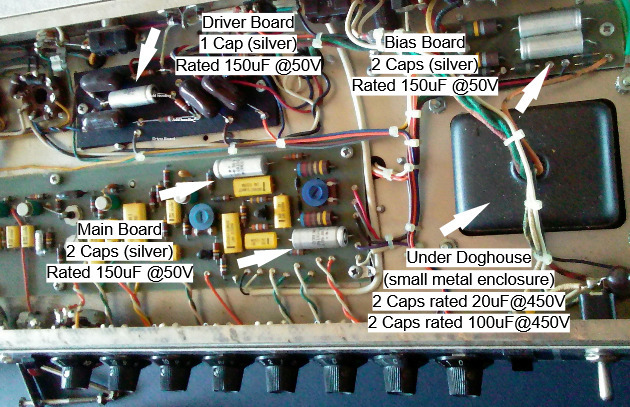 The silver cylinders on the graphic are the electrolytic capacitors on my HD 130 2x10 (chassis 2275). These store and regulate electric charge and feed it to the amp. The shopping list for a HD 130 2x10 caps and the 65w 2x12 caps are identical. It is recommended by some on the forum to change the ‘bleeder resistors’. I don’t know what a bleeder resistor is or what it looks like so maybe someone can post a pic (and a Mouser part #) if handy? Thanks RD112 for the Parstsconnexion recommend. I'll check out their prices prior to ordering, which will hopefully happen soon! Next thing - what multi-meter is a good choice not only for recapping but tube biasing? And why? I'd appreciate any recommendations for someone planning to maintain their amp for the long haul, not a cheap one off. No need for top of the line meter! I am a hobbyist, so I really don't see the need for top of the line test equipment. My old Fluke 87 died recently, (seems it's the main board!) After lamenting to an internet friend, he sent me an old Simpson 260-6, I hadn't used a needle type meter in years! I recently used it to troubleshoot and repair a little Blues Junior, and it worked fine. One needs to think a little more without auto ranging and such, but perfectly serviceable. CE,(AES) sells a great capacitance tester that I always used, instead of the Fluke. I hear you. I'm definitely not looking to break the bank and pro gear only makes sense if you're a pro. But these days costs have come down to the point where spending slightly more than you would on the cheapo option opens up a world of functionality and convenience, so the Mastech at $50 give or take looked like a pretty good option. Keen for any more comments or recommends. Just wondering if these are the right bleeder resistors (rated at 150k/2w) or offer a correction if I've mucked it up. I've assumed axial, and metal film, but who knows. Remember - this is thread for non-techs!! I'm looking to complete my Mouser order. Thanks.